As popular as the beans/rice combination is in Nigeria, I can probably count the number of times I've eaten it on one hand. After today, I might make it a bit more of a permanent fixture in my regular menu. It's certainly a wonderful way to pack in some extra protein. Start by sautéing the onions in oil, then add the chopped tomatoes. Cook for about 5 minutes until the onions are softened. Add the basmati rice and cover with a little water. Season with the stock cube, curry, thyme and salt. Turn the heat all the way down and simmer until the rice is soft. Stir in the cooked beans at the very end and cook for another minute or two. 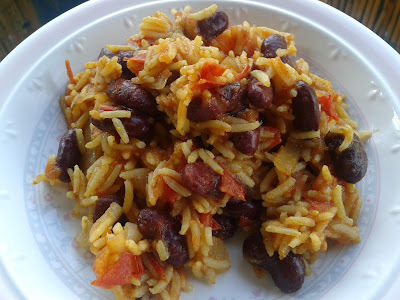 ooooo rice and beans...I love! I make beans & rice from time to time but never used kidney beans. Looks quite yummy on the plate though so I may change that soon. Simply exceptional. Essentially, i am shocked at what instructive matters you have educated us nowadays. you make running a blog look smooth. the general appearance of your net site is top notch, and in addition the substance material! Welcome! Exceptionally valuable suggestion on this particular post! it is the little alterations with a view to make the best changes.